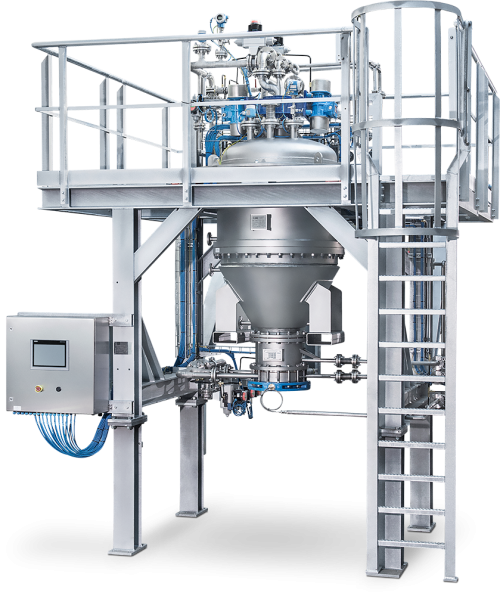 The BHS Pressure Plate Filter provides for thin-cake batch filtration, cake washing, drying, reslurry and automatic cake discharge as well as heel filtration in a pressure vessel. Cake can be discharged as dry cake, wet cake or a concentrated slurry. Units are available from 0.35 m² to full production models. Pressure Plate Filters are installed for clarification and recovery applications from liquids with low solids content ranging from 5% to PPM levels. The BHS filter plates are sloped, formed into a plate-stack and designed for high liquid flow and low pressure drop. The sealed plate-stack eliminates bypass of solids or liquids. For cake discharge, two motors, typically 1 HP or less, gently vibrate the plate stack causing the solids to move along the plates to the vessel wall and out of the bottom. Gas-assist for cake discharge is also possible. The BHS design eliminates rotating plates, gear boxes and mechanical seals for a low maintenance operation. Materials of construction are stainless steels and alloys. The filter media is a synthetic polymer or metal with a clean removal efficiency to 0.5 microns. As the cake builds up, removal efficiencies improve to less than 0.5 microns. Filter aid and activated carbon can also be used. “Reprint from “Pharmaceutical Engineering” , Jan/Feb 2007, The Official Magazine of the ISPE, International Society of Pharmaceutical Engineers.